Emily Dickinson (1830-1886) was a mystery in her own lifetime, and her poems continue to challenge their readers. For many, she remains a mythic recluse always dressed in white. Although factual knowledge has corrected that image, it was firmly established in Amherst long before the poet's death. Her works were largely neglected during her lifetime as most of her poems were published posthumously. Since Poems by Emily Dickinson appeared in 1890, readers have been raising questions about the poet, her world, and the works that have established her as a famous literary figure. An innovative writer who blurred the distinctions between poetry and prose, Dickinson is attracting a growing amount of scholarly attention. Critics have found her works elusive to interpret, and therefore, focus much research on her artistry and the practices of her editors. Now that Emily Dickinson's poetry has taken its place at the heart of the American literary canon, readers continue to examine the poet herself, the environment that sustained and challenged her, her artistic choices, and the implications of her poems. 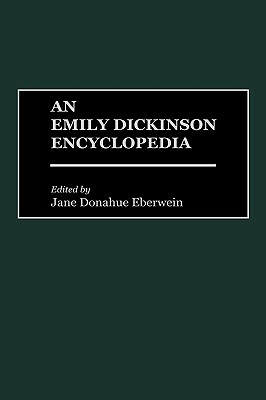 This encyclopedia features several hundred entries on persons, places, and institutions connected with Dickinson; cultural influences affecting her; stylistic aspects of her poetry; editorial and publication history; reception of her poems; critical approaches to her art; and modern responses to her in other art forms as well as thoughtful commentaries on a representative selection of poems. Recommendations for further reading follow each entry, and the book includes a general bibliography of cited Dickinson scholarship. The volume also features a chronology, appendices, and a guide to centers for archival research. JANE DONAHUE EBERWEIN is Professor of English and Coordinator of American Studies at Oakland University. Editor of Early American Poetry (1978) and author of Dickinson: Strategies of Limitation (1985), she has published widely on authors associated with an imaginative tradition grounded in New England Puritanism and is best known for studies of Anne Bradstreet and Emily Dickinson. She was a founding board member of the Emily Dickinson International Society and recently completed a term on the Executive Committee of the MLA Division on American Literature to 1800.